When you live in a studio apartment, people already think you're poor (and let's face it, you probably are). So it's important to serve rich and expensive looking dishes. I only have three chairs so that keeps the number of people I entertain to a minimum. My best friend lives in Wicker Park, I live in Edgewater, though both neighborhoods are in Chicago, she's really lazy and only comes to my apartment twice a year - so go big or go home, right? A lot of people overestimate the cost and skill of cooking fresh (live) shellfish. If you're going to do it, summer is the time as market prices are super low since August is primo season for mussels and lobster. I found one pound lobsters for TEN DOLLARS each at this little Vietnamese seafood market on my side of town. The mussels were also a good price at Whole Foods. While this isn't quite a typical New England clambake, it did finally give me a chance to use the new enameled cast iron pot I've been dreaming about. Ask me five years ago if I'd ever put one of these in my mouth...no way. Now that I'm a single mother, my palette has expanded. I made these once in a cooking class and fell in love, now I order them whenever I can. A few tips when purchasing live mussels: order by the pound, keep them cool but not submerged in water, if one is open and you cannot force it to shut - it's dead so throw it away. This recipe calls for dry vermouth, so you may as well buy the gin too and make dirty martinis! Step 1: Clean mussels and trim them of their beards. In an enameled cast iron pot, bring vermouth, butter, fennel, garlic, onion and spices to a boil. Step 2: Toss in mussels and shake pot to evenly distribute broth. Steam with lid on for three to six minutes, or until mussels open. 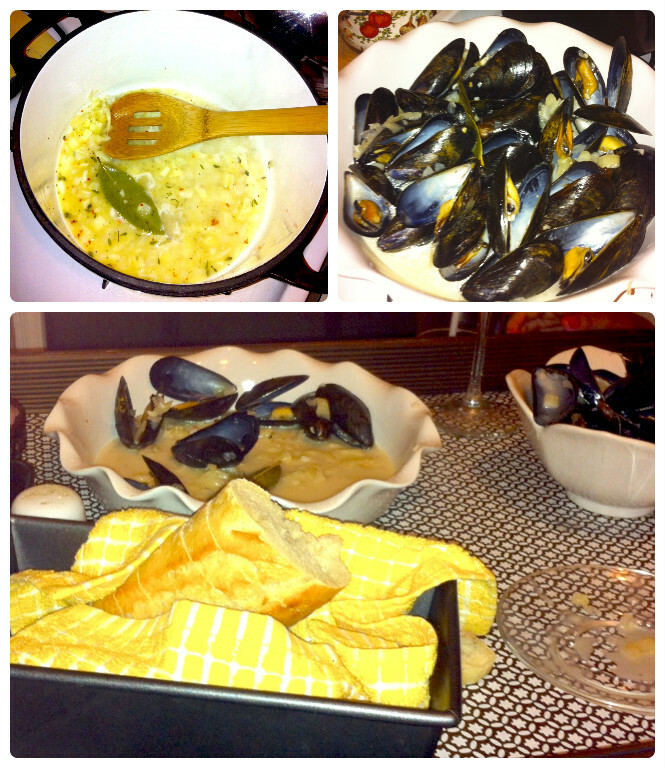 Step 3: Arrange mussels in a dish and boil broth one more minute. Ladle broth over mussels. Serve with warm crusty bread. 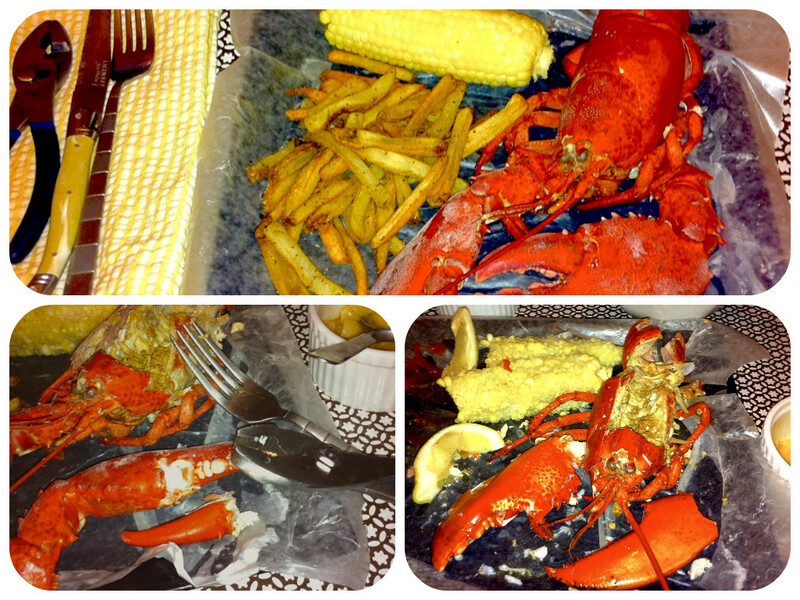 This was my first time boiling a whole lobster, and killing my own dinner. 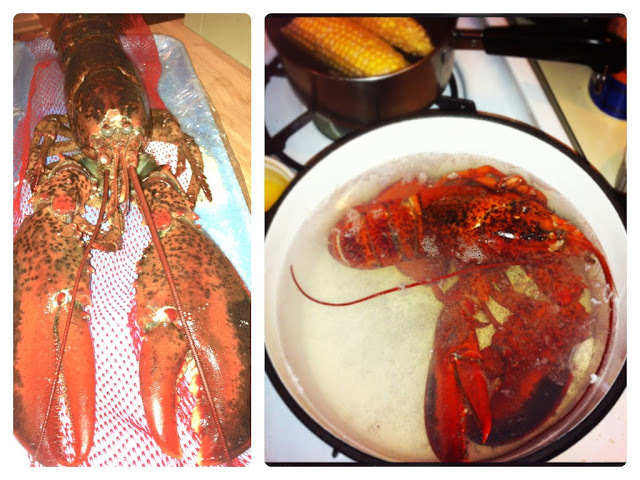 Lobsters are basically sea bugs, so I had no ethical conflict about sticking Clausen into boiling water. Once you're knuckle-deep in lobster flesh you won't even remember him crawling around in your fridge, they're pretty lazy anyways. Good lord this creature was delicious. There's a reason why they give you a bib when you order this out. It's nearly impossible to eat this like a gentleman, eventually you lay down your tools and dig out all that meat with your bare hands, butter dribbling down your face. If you don't have a seafood cracking set, improvise with household tools, like this pair of pliers. Eating lobster is an event, it takes considerable amount of time to hollow out these things. Take your time, savor each bite. Step 1: Bring water and 2 tbsp sea salt to a boil. Submerge lobster (grab him beneath the claws) head first into the water. Cover and let boil for one minute per ounce. Step 2: Make clarified butter by melting butter and skimming fat from the top. Step 3: Remove lobster, let rest on its back for a few minutes. Cut back and tail down the middle with kitchen sheers (craft scissors), dowse with warmed lemon wedges and get cracking!